Lecture 21 is a visual poem. From a magical snow capped universe to a present-day lecture hall, LECTURE 21 combines a fantasy story with a philosophical debate about the nature of art, centering on, Beethoven’s Ninth Symphony. 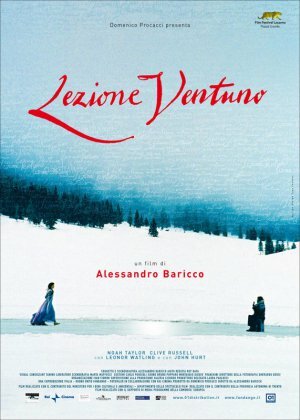 Peters, a music teacher and violinist, finds himself called to a remote village hidden in the snow. Here he finds his beliefs and perceptions about art, Beethoven, and even his own existence called into question by the villagers whilst they prepare for some mysterious “event”. Simultaneously, we are introduced to the enigmatic figure of Professor Mondrian Kilroy and his revolutionary Lecture 21, which challenges the conventional understanding of Beethoven’s Ode to Joy. Baricco masterfully blends styles in such a seamless way as to create a vivid tapestry in which the boundaries between reality and dreams are slowly destroyed.